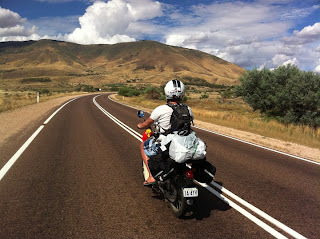 Number 54- Scooter Across Australia: TICK! Somehow, we did it! 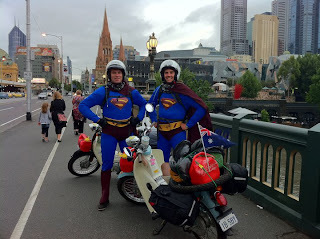 Joined by good friend Andy Thomas, we managed to ride two scooters from Perth all the way across Australia to Melbourne. 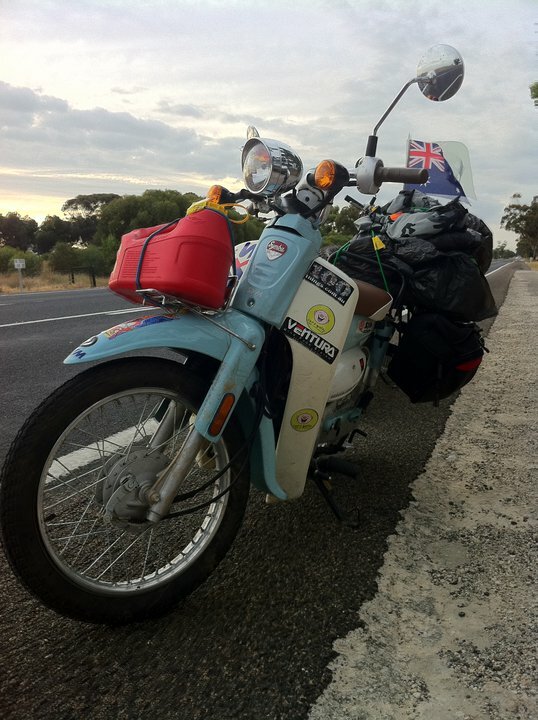 In doing so we managed to tick item Number 54- Scooter Across Australia. It really was a crazy week with 6am starts beginning what would end up being 12 hour riding days. Stuck in the saddle with the aim of doing 500kms per day, there was no short-cut around buzzing through Western Australia, South Australia and Victoria at an average of 85kph (yes; that's as quick as they'd go under weight). This of course meant one thing; two particularly sore back-sides, and as we rocked up to various road stops under the threat of night-fall, we'd stuff our face with service station food before grabbing a quick nights sleep. 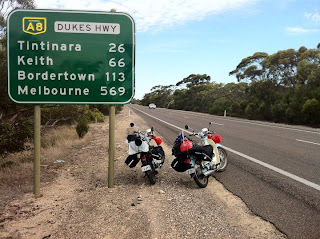 The hills just outside of Perth gave our Sym bikes a few hours of inclining roads before we then hit the flats which literally stayed with us all the way across the Nullarbor and on to Port August in South Australia where we hit the Barossa Valley. At this point, the reds and greys of the rugged Aussie bush turned into greens and blues of the more lush and fertile land which led us all the way into Melbourne. WIth Edna and Delilah (our names for our SYM scooters) eating up the road, we were struck with a flat tyre just 50kms past Noresman (the beginning of the Nullarbor) and it took us 2 hours to get over to change it! Between us we have the mechanical ability of a pair of donkeys and so when we did finally manage to get the bike back on the road; we were filled with excitement but even more relief. 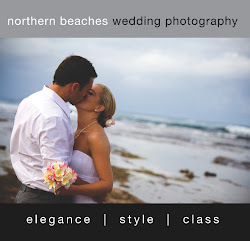 The weather conditions in Australia of late have been nothing short of extreme and amongst flooding, category 5 cyclones, heat waves and bush fires, somehow Andy and myself managed to weave untouched across 3 states. The hottest temps we got were across the Nullarbor on Day 3 when an afternoon of high 40's hugged our backs but this was as uncomfortable as we got. On most nights, far off lightning storms and rain showers put on a show made us think that we'd be getting wet sooner rather than later but thankfully the only rain we encountered lasted 5 minutes in our approach to Melbourne. 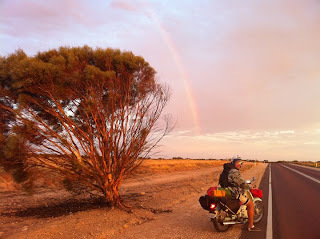 The seventh and final day of the trip started from Bordertown on the SA border. Under a slow rising sun which hid behind ominous grey clouds that refused to budge, Andy and myself excitedly started up Edna and Delilah dressed in slightly different riding gear to what we had worn for the previous 6 days; we had on two Superman fancy-dress costumes! 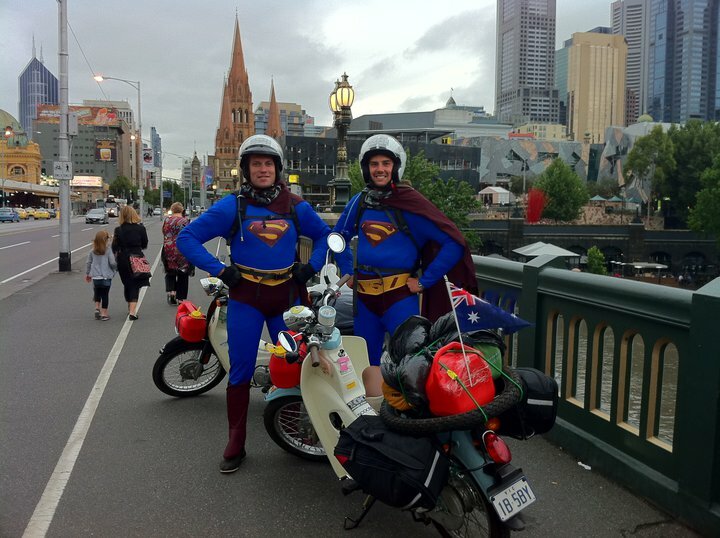 For 500kms, we B-lined it down the freeway as 2 superheroes, attracting the attention and laughter of everyone who was unlucky enough to see us. The cold weather meant that we actually wore all of our clothes underneath our costumes and so when we managed to wrestle on the top half of the ensembles on; we looked like two sightly fatter versions of Superman. 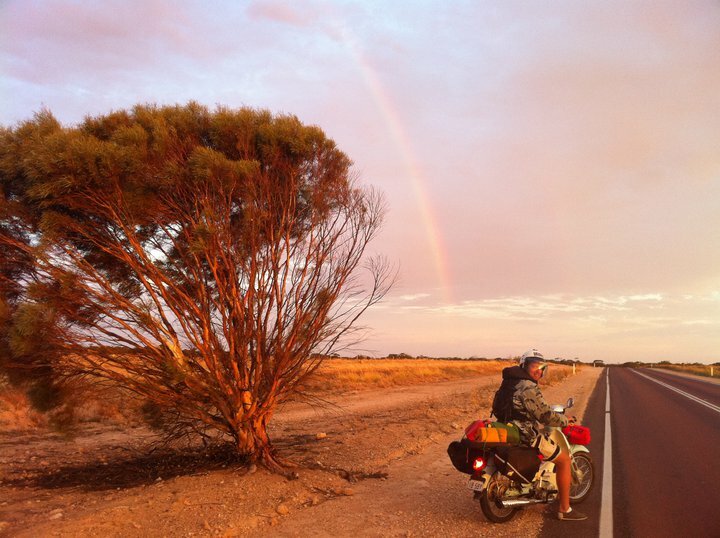 It took us 7 days of riding before we laid eyes on the Melbourne but when we did our smiles were huge. Late on Saturday afternoon we drove across the Yarra River before getting off our bikes and high-fiving each other; we had done it. The video footage that we caught along the way will be turned into a little documentary shortly but for now it's back to Sydney to get ready for a few months or madness as a a handful of items begin to line-up. There are literally thousands of pics to come and a more thorough write-up will also follow. I'd also like to say a big thanks to SYM Scooters who lent us Edna and Delilah, our 2 brand-new SYM SYMBA scooters. It's with the help of people such as Hollie and the team from Sym that this list of 100Things is possible. Thankyou so much as without yoru help, Andy and myself would still be walking somewhere near to Perth! 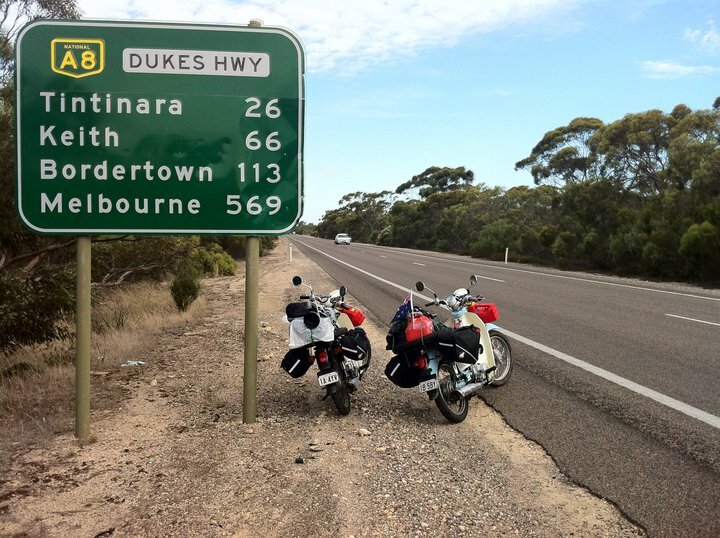 Number 54- Scoter Across Australia- TICK! 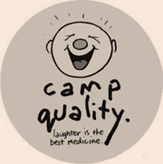 To read previous blogs, click HERE!